It is time for another free css template and it seems blue is popular nowadays hehe. Anyway I made this design originally for this website but it just didn't suit me somehow, just like many other designs I coded for Minimalistic Design. 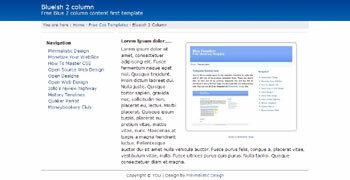 Blueish template is 2 column design ready with breadcrumbs, navigation and content area. It is suitable for blog and content websites. Hope you find it useful.